Stand up paddleboarding is an excellent way of working out the entire body mostly because you will be applying balance and strength in order to maintain an upright position as you move over water. It is a fact that paddleboarding presents you with one of the most excellent core workouts since the entire body muscles get involved. The intensity of a workout normally varies and it will largely be dependent on whether you choose to paddle upstream in rivers or in oceans using waves and currents. The latter will be more intense and if you take some time to drift with a tide, your training session will be gentler. Since your balance is a major aspect, your legs and feet will work hard to keep you and the paddleboard sturdy and balanced the entire time. Because you will also need to paddle while enjoying the new water sport, your shoulders, arms, back and hands will all be involved in gliding over water. At the same time, your back and abdominal muscles will be getting a superb workout. If you are an athlete who is struggling due to muscle or joint pains when running or doing other forms of exercises in the gym, paddleboarding will prove very helpful because it is a low impact sport. There are no violent impacts or heavy movements associated with the sport unless you run into large waves. You can easily avoid bruises, heavy knocks and bumps that are synonymous with sports such as rugby and football. You can actually paddle for many hours and burn thousands of calories without feeling creaky or achy when you wake up the following morning. The moment you begin paddleboarding, your fitness levels will undoubtedly increase significantly. It is a superb way of carrying out cross-training exercises considering you will be engaging muscles in your entire body. Individuals who are interested in both strength work outs and aerobic exercises will find paddleboarding a perfect sporting activity. Like all other sporting activities, paddleboarding provides numerous other benefits but unlike running, there will be no jarring to your muscles or joints. It is additionally good for releasing stress considering you can practice it in any water mass and rivers are a good example since they are places that can be quite relaxing as you enjoy the scenery. It is known that all outdoor activities provide people with lots of health benefits. Therefore, as you engage in paddleboarding, you are presented with a good opportunity to enjoy the sun, air and fresh air while you exercise. 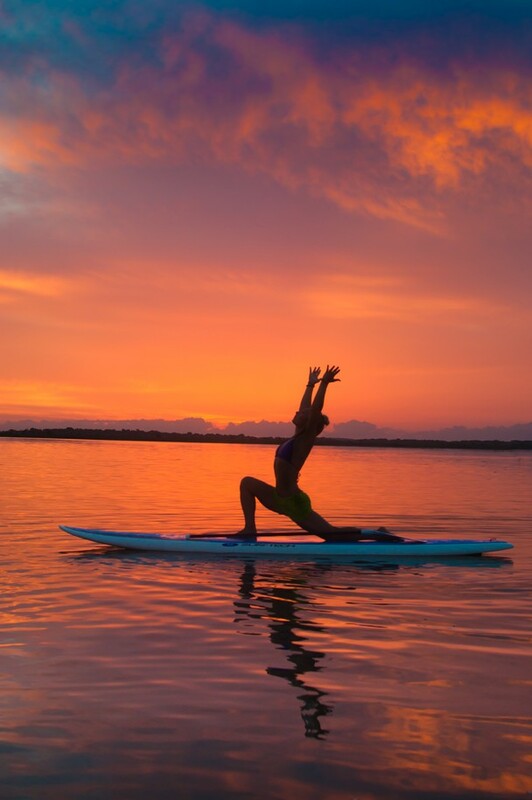 It may surprise you that more and more people are also doing yoga exercises on paddleboards more so because of the dimension of extra balance provided which is a lot of fun. Stand up paddleboarding requires a bit of practice because it is important for you to learn how to balance properly while paddling. You should expect to fall off a couple of times initially but this should not be a cause for concern because you will eventually learn the skill. Bear in mind that paddleboarding is perfect if you seek to work out your legs and muscles in order to maintain an upright position. This article was provided by Kate Gallagher – Kate writes for paddleboardingcentral.com, a site that helps new paddleboarders by giving all sorts of tips and reviews. If you want to learn a lot more about paddleboarding, head over to Paddleboarding Central today!